In 2012, RMTA completed a two-story office for the international mobile software company Data Systems International (DSI). After spending two decades in suburban Overland Park, Kansas, DSI was spurred by the recent development in downtown Kansas City and decided to move their corporate headquarters to the vibrant, urban core in the Power & Light district. Their existing workspace in a suburban area of town was dated and traditional, not reflective of the high-tech work they did on a daily basis. DSI wanted a new global headquarters that would better reflect their forward-thinking business model, their high-tech products and leave their international customer base with a lasting impression, as well as aid in the recruitment of top local and national talent. Moving to the urban core meant providing an office location in an area where their employees could live, work and play. With this in mind, the RMTA design team’s goal was to create a sleek, contemporary and dynamic digital work environment, reflective of the high-tech industry and of the client’s brand specifically. RMTA checked in with CEO Matt McGraw recently on company growth, how his new space has impacted day to day business and whether the design is still meeting expectations. RMTA: What were your top 3 most important considerations for your new office in 2012? MM: New employee recruitment, employee collaboration and a highly pleasurable work environment. RMTA: How has the design of DSI’s new office affected those goals? MM: I enjoy coming to the office. I’m really proud of this space. Now people visit our office and say it’s as nice as, if not nicer than, competing software firms on the East and West coasts. It sets a strong tone before we even begin engaging with new clients and that’s really worked for us. When people walk through those doors, they’ve already pretty much made up their minds; people envision themselves in a place before they make a move, and we are now getting a new generation of employees because of our space. Recruiting has become a lot easier because of the new space, and I think we really have a leg up in the industry because of that. Also, people like living downtown and being a part of the city life. I see people walking to work every day now. Now we just need more places for people to live [here in downtown Kansas City]. RMTA: So being downtown has served you and your company well, as well as DSI serving downtown in a way. RMTA: Have you seen a transformation in the way you interact with other businesses or the city based on your office location now? MM: Oh yeah, definitely. I serve on the downtown council and am also working with City Union Mission. We’ve been developing relationships with other businesses and tech companies downtown as well. It’s exciting. RMTA: You’ve been in the space for a little over two years now, right? How has the move affected your office culture? MM: [Three] years in April. Yes, it has definitely changed the office culture. Taking down those cubicle walls has made a big difference. Everyone is more approachable and more comfortable approaching each other. The glass walls in offices make team members interact and communicate more, even when someone’s on the phone you can see what’s going on and go in to talk when they’re done. It’s really an open environment. More people are using the seating areas in the corners or in the game room or in the café. Conference rooms are available to everyone with scheduling through the iPad [reservation system] that’s integrated into [Microsoft] Outlook. We went from a cube farm to an open environment where people interact more. The furniture is multi-purpose like file cabinets that roll out with seat cushions on them for impromptu meetings. Before I felt disconnected from the office and now everyone is much more connected. The office overall is smaller but the spaces are more public and interactive. We now have a lot of little collaboration areas and more conference areas and rooms. It’s really fostered an environment of collaboration. 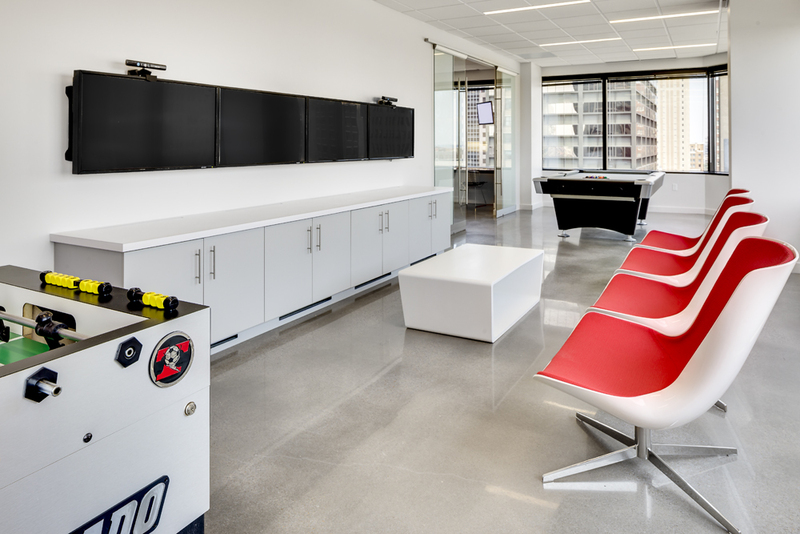 DSI chose 42,000 square feet of space among two floors of a high-rise building in downtown Kansas City for their new office. While the design team had to conform to the existing structure of the two floors within the high-rise building, they used the need for a connection between the two spaces as well as large windows spanning all sides of both floors to their advantage. Contemporary, modular white back-painted glass panels, extruded metal tiles, and a walnut soffit in the elevator lobby just off the reception area begin to set the scene for the tech company’s office space. A centralized glass, walnut and steel open stair in the main lobby was custom-designed to create a focal point within the space and to dynamically connect the two full floors, highlighting the newly constructed two-story volume. A lounge area with armchairs, high top seating at a “genius”-style bar and televisions was designed for customers spending the day in the office. The design team moved the area from an originally planned enclosed room to the open area opposite reception, placed to highlight the daily activity and life within the company. During the space planning stage, views were an integral part of design considerations. Drywall office fronts became transparent with sliding glass doors to allow natural daylight to filter throughout the office. Employees in open office spaces were provided with the best views of the Power & Light District. A game room and employee lounge area that includes a pool table, foosball table, televisions and video game systems, and features a wall of windows with views of downtown Kansas City below was designed adjacent to the break room, playing up the fun atmosphere the client wanted to provide for his employees. The client wanted one large break area that would reflect the feeling of an upscale café and casual meeting space, also serving as a centralized location for employees to socialize, meet or work in an open area. Mobility was a key factor in the design and the client wanted spaces that would serve multiple functions. Employees are encouraged to use all areas of the new office space for work. Teams are now seen meeting in the cafe or working on their own projects at all hours of the day. “We went from a cube farm to an open environment where people interact more,” McGraw said. The design team also focused on incorporating the latest tech features throughout the space. Conference rooms with custom-engineered iPad room reservation systems and touchscreen televisions were incorporated throughout the office. A customer experience room is situated adjacent to the lobby and customer lounge area, featuring 9 interactive large-screen televisions inset into white back-painted glass paneling, where product demonstrations and web conferences take place. The glass doors in the room were designed to frost over electronically for privacy. Next Post → Join our team!